But, there’s something else going on in vacation rentals which is similar, but isn’t ideal. What I see happening is this: some travel information sites are listing vacation rentals, and allowing consumers to rate/review those rental properties. The rental properties are associated with a particular rental agency, and the travel info site is assigning all those reviews to the rental agency that they roll up under. Now, this works well for cases where the property is handled by one company which handles the rental and property management. However, there are a lot of cases where multiple rental agents from different companies may be renting out the same property, depending upon who lets it out to a renter first. In those cases, having all the reviews rolling up under one company is unfair. Where vacation rentals are concerned, I believe that consumers are also fairly naive about what it is that they are reviewing. They are likely being led to believe they’re reviewing the property itself — and if they property isn’t owned by the company managing it, details about its amenities maybe shouldn’t be applied to the rental company. For instance, the process of reserving and renting the property may have sucked, but the consumer is mainly being asked about how great the Wi-Fi was, the hottub, and the quality of the window views. In most cases I’ve looked at across the country, the large bulk of these reviews are coming from FlipKey, operated by TripAdvisor. FlipKey’s interface for reviewing the rentals encourages the property be reviewed more than the rental agency, as I suspected. The review form is titled “Rate this vacation rental”, rather than “Rate the property management company”, and it says “Review your stay”. Their tips do suggest that one “Describe the service you received”, but it also says “Tell us how you liked the home”, and to “Talk about the location and amenities” — neither of which are necessarily controlled at all by the property agency. But, as I see it the primary issue is whether reviews of individual rental properties ought to be rolled-up into an aggregate to represent the rental agency in this manner. Google has no quick way of assessing instances where properties may be represented by multiple rental agents, and property owners sometimes switch the agents representing them — in which case do the reviews then get reassigned to the new rental agency, or do they stay associated with the first rental agent as part of their legacy? This appears to be a form of spam. 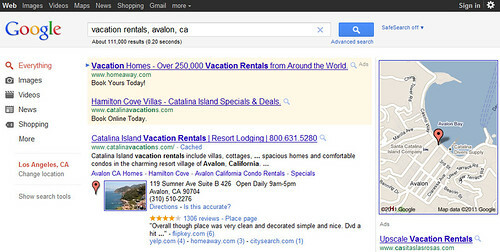 FlipKey has been clever with design this so that individual vacation rental reviews will roll up collectively under rental agent listings, and having their data associated importantly with so many businesses is useful in terms of some referral traffic as well as a promotion vehicle for potential advertisers. This is yet another problem which Google has associated with user reviews and business listings. Not long ago, Google Maps rolled out “Descriptive Terms” derived from user reviews, causing undesirable and often unfair effects for local businesses. This entry was posted in Google, Local Search, Online Marketing and tagged Google Maps reviews, Local Search Engine Optimization, local seo, online reviews, user reviews by Chris Silver Smith. Bookmark the permalink. I think they answer, to some extent, to many of the questions set in the article. Some great digging you’ve done here. I do think their may be an intent to confuse here if the customer thinks they are simply reviewing a cabin and not an agency. The rental could be great but the agency could be good/bad/indifferent. The other thing your post makes me wonder is whether having 1300+ reviews, period, doesn’t take the world of reviews beyond being useful. Who is actually going to READ that many reviews? It all just becomes about numbers. Yeah, I agree, I think if you want to avoid having your listing flagged you may just have to make it look more like a general business. What an interesting read on the old annoying topic of spamming. This clearly can be a grey area. I have always wondered how the rating and review systems work on these travel sites. Google eventually plays catchup! I also noticed that there is a problem. This is not perfect reviews system and Google should pay more attention to this issue. You are right Google will eventually catch up its only a matter of time i typically don’t read past the first few reviews on a page when looking to vacation somewhere 1300+ hmmm that’s excessive.